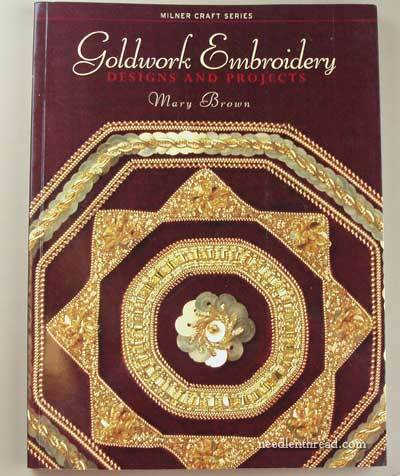 Goldwork Embroidery by Mary Brown – Book Give-Away! Methinks today is a good day to give away a very nice goldwork embroidery book, called Goldwork Embroidery: Designs and Projects by Australian embroiderer, Mary Brown. You’re very welcome to ready my review of Goldwork Embroidery if you like. It was written in the days before my more in-depth approach to book reviews, but the essentials are there, and my opinion of the book hasn’t changed any! Goldwork Embroidery is not newly published – it was published before 2007 – and in fact, this copy of the book is not brand new. But it’s practically brand new! The copy came to me through a friend who is a quilter, but who also enjoyed a brief stint with embroidery before going back to her first love, quilting. She had quite a few very nice embroidery books on her shelf, most of which have been hardly touched, so she passed them on to me. They’re all repeats of my own library, and so I am passing them on to you! 1. Leave a comment below, on this post on the website. Comments received via e-mail (including email replies to the daily newsletter) or on other posts don’t count! So make sure you leave your comment on this post, on the website! You can follow this link to leave your comment. Are you new to goldwork? Or have you done it before? What do you like best about goldwork? What attracts you to it? Do you have any fear of goldwork? If so, what is it based on? Do you have any favorite goldwork technique, or favorite goldwork thread? (or anything along those lines). The reason for the question is to weed out the folks who comment just to win something without any idea of what it is – most likely to re-sell. So comments like “nice book” or “I want this” or “Thanks for the book” or “pick me” don’t count towards the draw. I really want the embroidery books I give away on Needle ‘n Thread to go to folks who will use and appreciate them. That’s why I ask the questions – it really isn’t to make you work harder! 3. Comments should be left by Monday, March 26, 2012, 5:00 am US Central time. On Monday morning in the wee hours, I will randomly draw a winner and announce it on the website. The winner must then contact me with a shipping address so I can send the book on its way! And that’s it – easy really! So, if you’re keen on getting your little paws on a fun and interesting goldwork book, and this one isn’t in your library yet, do join in the draw! It’s a lovely book and a great addition to anyone’s stitching resources! March 26, 2012 Goldwork Embroidery Book Winner! Love,love your site. Such great and interesting info. This book looks absolutely delightful !!!! Hi Mary – this is a most beautiful book on a most beautiful form of needlework. I have never done gold work, but your recent thread (pardon the pun) of blog posts has certainly inspired me. I’d love to have the book. I’m a novice at Gold work. I bought a beautiful blue sari with a gold embroidered border and asked the tailor for the remainder of the material. Removed the gold strands and couched them on a sampler. It was so easy, I couldn’t believe it. And so beautiful. I’d like to try ALL the stitches you’ve done on the goldwork piece. And a compilation in a book like this would simply be a treat. Thanks for the opportunity, as always, to win. I LOVE,LOVE,LOVE goldwork, The bought the Royal Needlework embrodery book and i have tried my first piece. I folded the design, and guess what i messed up the goldwork not understanding nicely how to treat the metal. So SIGH i will have to unpick my carefully laid down gold metal strips. What attracts me is the gold itself and how it compliments the black, blues, greens and red, and the rich feel that it gives the work almost like it comes out of another era, just to beautiful. What i fear most about goldwork where it joins, i fear i have not mastered that and that spoils the only Piece i have ever done. The other fear is when to strech it and when not, when to secure it and when not to. I have seen in one of the Inspiration magazines a Scarub beetle in blue, with blue and green embrodery with a cartoush in goldwork, it looks STUNNING!!! !I am afraid i do not have the confidence to embark on such a project until i learn some more about goldwork, hence i am entering the free book giveaway with hopes as i feel this book could definately teach me some more about Goldwork. PS Thank you for the opportunity to enter this competion. Leonie, That scarub beetle sounds lovely! For someone who hates bugs in the house, I love drawings/paintings of bugs. Although I would love this book, it sounds as though you deserve it more. Good luck! I have done a little gold work with my embroidery in the past, and would like to do more in the future. Although through your posts i have learned a lot already (thank you) and i do have Erica Wilson’s book which cover gold work, i would love to know more and would cherish the book and pass it on to my daughter who also embroiders. This is very generous of you after all the goodies you gave us at Christmas! Thank you for all you do for us! I’ve never tried goldwork before, just admired the glorious stitches from a far. 2 close friends have been tempting me for years with their fine stitch work on court costuming for our Northern and Southern California Renaissance Faire guilds. I’ve dabbled with faux gold work machine embroidery, and would like to try my hand with the art of gold work. You are so generous with you many contests, thank you for sharing your bounty with your blog family. On your recommendation I bought the wonderful goldwork book by Hazel Everett. Goldwork does intrigue me, and I love looking at what you have done as well as others. I have yet to do goldwork though I have a small kit with some goldwork in it, yet to be done. I worry more that I won’t get the fabric tight enough. I do thread embroidery and use a hoop for this. I guess it is a matter of taking that first step with goldwork and rewatching and reading all I can on doing this type of embroidery. My books are my treasures and I rarely let them leave my home, I have one or two close friends I will lend them to, but I almost fret till they come back home to me.. call me crazy, others have. I treasure my books also and won’t lend them out. I did once 35 years ago and learned the hard never to trust anyone again. The lady that “borrowed” it said she couldn’t find it and gave me the money I paid for it but guess what-it was no longer in print. We didn’t have Amazon back then where you could locate used books across the country so it’s never to be replaced. Oh, my gosh. What a beautiful book. I love goldwork and currently working on a gold and silk piece. Maybe, I’ll get lucky. I would love to add it to my library and possibly do several of the projects. I have several projects in my stash that include some goldwork, but have hesitated starting them. A book like this would give me some confidence to tackle them. I haven’t ever done any goldwork. I find it intimidating, but I sure want to try it. Everything done in goldwork looks so regal and ever lasting. I am interested in Elizabethan embroidery and they used a lot of gold threads in their designs, so it may be soon when I take the plunge. I saw that Tanja Berlin has some very beautiful beginner kits on her website. Maybe I’ll start with one of those. Thank you for mentioning Tanja Berlin. I think a kit would be nice for a beginner in goldwork like me. I like to start with a kit then go on to bigger, better, more original things. I checked her site and like the rooster and peacock feather. I have no friends that embroider & belonging to this blog is the next best thing. I have not done any goldwork. Yes, I am afraid of it. To me it is comparable to a Master’s Degree of surface embroidery.I aspire to reach that point! Until I am worthy I practice, pratice, pratice each technique before I move on to another. I am determined to at least moderately accomplish all needlework processes before I am called to “Needlework Heaven.” This is why I am building my needlework library. The books are my stimulus. Plus, your medallion work is a carrot at the end of the stick for me! Goldwork…so many mixed thoughts, but mostly fear! I’ve had gold added to an incredible sampler by Lucy Lyons Willis, her Firebird Sampler. I did an EGA group correspondence course many year ago, and there was a lot of couching with gold. It’s the cover of this book that caught my eye: it looks like a Sailor’s Valentine. I have a real shell valentire, thanks to my family, and I’ve been intrigued with the idea of creating one with embroidery! We have SO many stitches, so many beads…so much GOLD and other metallics…I’ve collected as many pictures as I can on the valentines, and one day, I will create my own! Thanks for the chance at the book! It really does look awesome! Even though it attracts me like a magpie to something shiny in the grass, I have never tried goldwork before. I love the textures that can be created with the different types of gold and the way they are put together. My biggest fear is that I would muck up an otherwise lovely piece because the goldwork was beyond my skill. This fear is based purely on my stitching insecurities. I know exactly how you feel, but you need to go ahead and “jump in”! You won’t regret it. I’m an American living in England and have been very lucky to visit several places where I was able to see a number of pieces of goldwork – some hundreds of years old and other decades old and all gorgeous. There is a book which was published here last year which might be of interest to you. It has a great deal of information about materials for goldwork, how to use them and stitch them, and also gives a goodly number of small projects. The book is “Goldwork Techniques, Projects and Pure Inspiration” by Hazel Everett. It was published by Search Press – ISBN: 978-1-84448-7. I am new to embroidery and needlepoint as of last September. I did do some crewel years ago and suddenly had the urge to pick up a needle. Little did I know of the wonderful changes that have occurred, the beautiful threads available now, the cloth, the canvases. I am like a kid in a candy shop and I’m learning so much. I don’t know much at all about Goldwork except that it is so beautiful and mysterious to look at, awesome really. In the past month I have been searching the internet and looking at photos of finished pieces and wondering if I have enough knowledge to step into trying a piece. Your book sounds like just the thing to help me along and I would treasure it and offer it a wonderful home. And trust me, no book in this house sits on a shelf unused and unread! But in any case, your daily emails are a joy to read and I’d like you to know how much I appreciate them! Keep them coming, I’m soaking it all up! Hi Mary, thanks to you and your friend for this give-away. I have done a little goldwork. Mostly on my Japanese embroidery but also the Floral Glove and a couple of other small projects. I like the challenge of goldwork but most of all I like the BLING! I don’t think I have any fear of goldwork but I do think that it is one of the more challenging embroidery techniques. I don’t think that I have a favourite goldwork technique but I love couching and am keen to attempt a piece of Or Nue. ps. I love reading the comments on your give-aways. It is fascinating to read all of the different response to your questions. Isn’t it wonderful how different we all are. I am new to Gold Work and so to have a book like Mary Brown’s where the 15 projects are detailed with instructions would be really useful. Thank you to you and your friend for this opportunity to learn more. My first experience of goldwork was not good. I went to an Or Nue workshop, did not like the kits which were available, and the tutor was one of the few people I have met that I did not get on with. When I got home I checked out the technique in a Royal School of Needlework book, and found that both the the materials used and the teachiong left much to be desired. That was a few years ago. Last summer I went to ‘Goldwork Part 1′ at our local beanch of the Embroiderers’ Guild. What a contrast! We had a talk from the ladies from Golden Hinde the day before, so were well prepared mentally for what was in store. They brought their ‘shop’ and we all stocked up on their goodies. At the end of the day we all had about 2 hours more work to complete our piece. I love using silk, and I was hooked on the gold. Since then I have completed my own design of Sydney Opera House. and am now planning to incorporate all the lovely bugs from Hazel Everett’s book into a project which is in progress. YOu were right about Hazel everett’s book – I did NEED it! I have never done any goldwork yet, but would sure like to give it a try. It has a beauty all it’s own from what I can see. I can imagine doing this type of embroidery on a deep shade of velvet, kind of would make it look like royalty. I love embroidery, and this would be one more type for me to experience with. I fall into the goldworker want to be category…..I admire many goldwork pieces, but have yet to take the plunge myself. I really want to though and this book may be just what I need to do that! I am new at goldwork. I have been following the steps you have shown. I am intrigued by the beauty and delicacy of the thread outcomes. The time consumption seems to be worth the effort as a lifeless piece becomes a beautiful work of art. Morning Mary! Ah, Goldwork…..I’ve never tried it, but have been in awe of some of the things that I’ve followed you on, especially the little rosette that you did and the Medallion. I’ve never really done any surface embroidery, I started out with cross stitch, then tried a little Crazy Quilting, then went back to cross stitch, but you have really picked my interest in this type of embroidery. Before I found you site, whenever I heard the word “goldwork” I always just thought of gold thread, but now I realize there are so many different types of “gold thread”. I really need to start stocking up on stretcher bars (deep down I’m saving for one of the Needle Needs frames that you showed us! )and all the other “stuff” that you’ve shown us!! Oh yes….I would really love to have this book! Goldwork is one of my favorite forms of embroidery, and I’ve taken about a dozen classes in goldwork techniques, mostly from Michele Roberts at EGA and ANG seminars. Other than the obvious (oooh! shiny! ), there is no other technique that has the obvious richness–for such a small expenditure of energy! The hardest part is cutting the metals carefully and getting rid of the sharp edges carefully–but even that becomes easier with practice. I love purl purl because of the variety of sizes and the many different applications, and I like bright check because of the texture it adds, and I like plate because of the way it reflects the light and I like–never mind, I like it all. I have always been attracted to goldwork, but live in a pretty rural area, without access to supplies for it, or even the knowledge of what I might need. I did a tiny bit of it once when I took an online embroidery course, but I’ve really enjoyed following your work with it on the medallion project, and love the look of the dots especially. I have a special project in mind to make next and think I could use some goldwork on it. I would love to win this book. I haven’t done any gold-work yet, and I really want to learn. I have a kit where I missed the class, and a very fond memory. I had a blazer when I was a teen that had a gold-work crest on it. At one point after I had been wearing it a couple of years one of the threads on the badge got caught on something and I could tell it was a spiral wire. If I had known then what I know now, I could have fixed it! After completing the Nesting Place, (determined beginner) I discovered I love hand needle work. So I would like to become more involved into this technique called Gold Work. It seems quite involved, yet the challenge I want. This book I believe would be a good reference, (does not replace you) for me to tackle this type of needle work. Thanks for this possible opportunity. Hm, goldwork. I’ve done a little and hope to do more. I actually found some thread on a braiders’ website that I found makes a good couching thread — nice and thin and slides through well. As with most of my embroidery, I focus on historic techniques … but that leaves a nice wide open field! I do find that the true metals behave better than the mylar ones, though I use plenty of the mylar for simpler applications which keeps the wallet happier! I’m just getting started with goldwork. I had tried to stay away but since I love all embroidery with silk I’m realizing that touches of goldwork really enhance silk embroidery. Since I’m still in the learning stage I don’t have any favorite techniques though line creating techniques seem to attract me the most. Mary, I am an embroiderer since childhood but new to goldwork. In fact I’m working on my first piece now with my ANG chapter. I think the medium is beautiful and am very interested in learning more and would love to add a goldwork book to my needlework library. I am totally new to Goldwork and have recently purchased a Raised Gold Stumpwork kit from Rajmahal called Extravaganza. While I have some needlework knowledge, I’m sure that Mary Browns’ book on Goldwork embroidery would be a huge help as I am a little nervous about starting the kit. Thank you for being so kind and generous with your giveaways. I am very new to Goldwork and have just recently purchased a couple of books on Goldwork that I saw mentioned on your site in the books section. The thing I like about the gold work is not only the look but different textures it offers. I am intimidated by working with it however as it is expensive and you sure would not want to mess up and waste any of the threads. But I am sure I will be trying it soon. Our embroidery guild is doing a class on it and even though I can not attend our group leader will be going and bring back all the info and project. I would absolutely thrilled to have this book. I have never tried gold work, but as I am beginning a journey into sewing and embroidering historical purses, it is a necessary skill I’ll need (and already intend to learn.) My passion is medieval alms purses of the 14-15th century. They used a lot of gold work and gold thread couching in those purses as they were meant to carry alms on religious pilgrimages. (think Canterbury Tales) I am also interested in the reticules of the Jane Austin time period. They hold such a romantic air about them. I can just imagine now a lovely blue silk reticule with gold work on it. Take me to the ball!!! I would love to recreate some of those historical masterpieces, and this book would certainly help me on my way. Thank you for offering it. I would love to have this book! I have not done much gold work but would love to do more. It is so beautiful. Not having much experience, I don’t have a favorite technique or thread but would really love to learn more. Thank you so much for the great website and the wonderful information you provide! I love the glitz of goldwork and do it when I have time. I find that I have to set out blocks of time to work on any goldwork project. My favorite goldwork project that I am currently working on is Kay Stanis’ Golden Roses. I hope to finish it by our 45th wedding anniversary next year. collection as I know all stitchers do things different and I like picking up the hints etc. so my stitching can be better for myself. I have never really seriously tried goldwork, a few bits of gold in other things I have stitched, but not a whole piece. I am somewhat scared off by the stiffness of some of the threads and the consequent difficulty in manipulating them. However, it is one of the things on my embroidery’bucket list’! One of these days….. I took a one day intro to goldwork class years ago and really likes the techniques. For some reason though, I’ve been afraid to try much of it on my own. I think part of what holds me back is the expense of the threads. I’m not afraid to rip it out if I make a mistake while doing other types of stitching, but I don’t want to ruin the expensive threads needed for goldwork. I really should just decide to do a small, but involved piece on my own so I can gain more confidence. Trying goldwork has always been so intimidating for me. Just the thought of working with gold and getting it right sends my head spinning; my hands sweating! I nearly stopped breathing when I saw your beautiful outline work! But, Mary, watching you work on the Medallion and all your perfect stitches made me decide to give it a try…just to buy a piece to experiment with. So with your work to inspire me, I will be brave! Hello to all. I am a newbie to goldwork. Because of you, Mary, and this site, I have started collecting gold threads. I don’t have any patterns dedicated exclusively to this kind of embroidery but I do lots of handwork and think everything could use a little bling in it. I have not been successful YET. But I will be. My first attempts at using this thread were not very good so I think that the purchase of a good book along with a laying tool is needed. This looks a delightful book. I do appreciate the chance to win. You are such an inspiration. I cannot wait to see the next installment on your current project and I don’t care if you do post dot by dot! I have done very little gold work and only with DMC metal threads. I really want to do real gold work but I’m intimidated. I feel like I just don’t know enough yet, even though I’ve read all your posts on it. I think I’m afraid of the cost, that if I mess it up it’s such an expensive mistake. The part that I’m really in love with is the chips that you used in the pomegranate and the little dots of the medallion. I am new to goldwork. I have one project to my name including goldwork and it is not quite finished yet. The goldwork part is finished but I am not completely happy with it. The thread lost some of its shine as I was stitching and I realize that at least one contributing factor is that I probably used too long of a piece. Should have used shorter pieces to reduce the amount of stress on the thread and stitches. I am afraid of using gold thread because of this very thing. The elegance and rich potential of using this thread and method is too intriguing too not try and master though so I don’t think the fear will get the best of me. What I like best about goldwork embroidery is that it really communicates proficiency and beauty through the materials used as well as the design itself. I worked as a jeweler in the 80’s and 90’s, so I’m no stranger to the ways of metal…but I haven’t plunged into goldwork all the way – just tried couching some borders with a few Kreinik braids and threads. I’ve also sampled some of the very fine clover threads in a vain attempt at underside couching. I’m really attracted to goldwork because of the rich history and it’s intrinsic beauty (when not overdone! ), but I’ve still not invested in the materials and special scissors for committing to the real deal. Fear?…only of not having enough time in my life to do it all! LOL…Perhaps this book would give me the final push to make a genuine effort. Thanks for the opportunity! I am new to goldwork, I have been on a course with Hazel Everett in January this year and am eager to learn more. I loved the coloured purls and I love chipping. Some techniques I have found quite imtimidating – for example plunging the twisted threads that were couched down and I definitely need more practise in that. I also had some trouble working in the Ophir thread as mine shredded, but I do want to progress in proficiency in goldwork, and would love this book to learn more. Love the site – I visit every day to see what’s going on and have loved the stitch play and glitches recently – they have given me inspiration for some of my projects. Thank you, Mary. Have never done goldwork. Goldwork Embroidery Book would be a good way to start. Thank You. Having never done Goldwork and being afraid to try, I would love to have a guide in my hands to read and study. I have been facinated by your introduction too me by way of the Medallion project and have read and reread your work on this project. I believe I would give it a try with a book to guide me every step of the way. Thank you, Mary, for your introduction to this art of embroidery. Also enjoy your Website – Blog. I love doing gold work. I am attract, off course, by the sparkles … but I love all the different kind of threads and metals. I just did finish a gold work stomacher and skirt to be used on my 1760 replica doll (I wish there was a way to post the picture). My favorithe thread to work with is : Pearl Purl … but I also love chipping. My only complain is that the threads are expensive … just like gold. Mary, I have never attempted goldwork but so enjoy keeping up with yours. It is on y list of things to try for sure. How can anyone not like it? Hi-Jane, I am not a huge fan of goldwork myself. However, I agree that it is lovely to look at. Some of us needleworkers love pure yarns and threads that are not mingled with other materials such as metals or solid embellishments. I have used metallic colored rayon threads and metal-wrapped threads, but not classified as “goldwork”. It’s just a matter of taste and preference. Best of luck to you with this contest! So I’ve decided to leave a comment. I love goldwork for his luxuriant aspect and for the peculiar points own to this embroidery tecniques. I’ve never tried it for two main reasons. First, here in Italy few people dedicate to it and it’s difficult to find teachers and works to admire. Then, the expensive materials stop me in goldwork improvisation. I don’t think I’ll never dedicate myself exclusively to goldwork, but I’ll like the book, first of all, becouse I love all embroidery tecniques and I would know anything about them, then becouse I would like to insert in my white works some goldwork shining and points. I am new to goldwork. I want to be able to use goldwork techniques for ecclesiastical embroidery. The expense of some of the materials is what keeps me from diving in. If there were a class close to me, I would sign up for it in a heartbeat. This would be the next best thing. I’m an avid needlepointer. New to goldwork. My first and only piece so far has been Circle of Flowers by Margaret Kinsey. I have gone thru a range of emotions from excitement to start it. Dismayed that it took me a day just to get the silk on evertites. Horror at trying to keep the gold from crimping. “I don’t like this and will never do one again” to utter joy when it was finished & I loved the piece. I will do another one and have started looking at other pieces. I do need a good goldwork book. I need to read, study and practice. Tks for the opportunity to throw my name in the pot. Hi Mary, I have done once working with gold thread and silk. The effect is just fabulous. Ever since I subscribed to your site, your goldwork has sucked me in (especially the chipping which looks SO COOL!) I know I need to try this but still haven’t taken the plunge. I have done just a little work with gold or metalic threads, recently on a crazy quilt patch. It is very interesting to me and I can see trying it perhaps on a piece of blackwork. Thanks so much for your newsletters and your wonderful instructions. I look forward to it every day! I’m new to goldwork, but I’m jumping in with both feet. We’re having a class with my local guild in early autumn. Right before I head off to EGA Seminar where I’m registered for a goldwork class with Toni Gerdes. I’ve got some projects in my stash that I’m ready to attempt on my own and the more reference material I have, the happier I’ll be! Oh, isn’t that beautiful. I’ve never tried goldwork before. It looks very daunting. I’ve only ever used plain cotton before in my embroidery, but would love to expand my needle’s horizons! After seeing all the goldwork you do on your projects, I am intrigued. I would like to try goldwork but am afraid of how hard it is, in my view. I’ve tried to use some gold threads in embroidery projects but it gets all twisted. Perhaps a book would help me get over my fear of messing up a project by using gold threads. I would really like to try the wrapped gold work you have done on your recent medallion project…it looks so beautiful. Don’t know if I answered your questions, but I would use this book if I won it…would never sell it! I have not done any goldwork yet, although I do have some thread that I have been trying to decide what project to start on. I do a lot of embroidery, including some needlepainting (I prefer chain stitch fill to long/short, but have a project in mind to try long/short). I love the sheen it gives to the projects you have shown & really want to get started on it. I’m hoping to get good enough at it to make a stole for our minister. Love your site! I have added several new stitches to my work thanks to your stitch tutorials. I would love to add goldwork to my list of skills as well. Hi-Mary – PLEASE DON’T SUBMIT ME IN THIS CONTEST- I just want to say that I’m glad about the restrictions you’ve placed on the postings. We’ve all seen these empty-content postings where people just try for a freebie. Best of luck to the future winner. I would love the goldwork book. I’m trying to learn everything I can about goldwork for embroidery I’m doing for my church. My next project is a banner for our Daughters of the King chapter. I hope to incorporate some goldwork. I love goldwork – it is much easier than I thought it would be – and it is fun. I love the glow and the sparkle it adds. I follow your posts, enjoy them and have learn a lot from them. I have tried some of your techniques but goldwork is something I am very much afraid to try. Perhaps if I were to win this book, reading thru it could make it easy for me to try it. I would love this because I am just starting to embroider, doing ‘The Nesting Place’ course. I hope to start some goldwork soon. I also hope to be attending a beginners goldwork course at the Royal School of Needlework in London this year. I live within travelling distance for this. I would love another good goldwork book. I am currently taking EGA Spring Splendor. I have just started with the silk on the butterfly. Previously I took the 9-lesson silk and metal ICC. I do get frustrated with the fact that the metals tarnish, but am still drawn to stitching with it. Although I have taken a couple of classes in goldwork at ANG seminars, I still feel that I am still inexperienced when it comes to the art of this embroidery technique. However, your current piece of silk and goldwork embroidery has made me want to reach out and really learn much more about goldwork. Goldwork adds so much dimension and richness to needlework, and it seems that the technique could be used in contemporary designs as effectively as in more traditional work. Thank you for your wonderful tutorials on this topic. I don’t think I have officially done goldwork, but I have worked with Japan gold and gold metallic threads from DMC and Krennick. I am a crazy quilter and one of my favorites is to make my cq blocks from white and off white fabrics and then embellish the seams and patches with white and gold and sometimes silver threads, beads, silk ribbons etc. I remember the first time I used Japan gold and was very frustrated that it wouldn’t stitch in and out of the fabric like other threads. Then I learned how to use it and like to couch it down with other stitches as part of a seam treatment. I love the sparkle it adds, and I would love to learn more about the correct way to do goldwork. Never having done any gold work I’d love to own a how to book. Truly, I never heard anything about gold work until I started receiving Mary’s E-ails and have grown to love it. That type of needlework looks like such a challenge that I know it would be great fun to try. I have only been doing this form of embroidery work for a short time- I learned how at costume college in 2010. I have been gathering my nerve and some materials to launch what is for me an expensive project- a silk velvet jacket with metal embroidery. I have a couple of books in my library that detail various aspects of this beautiful form of decoration, but this one looks like a superb addition! This looks like a beautiful book. I have never done any gold work, but from what I have seen on blogs lately, I would love to try it. I really enjoy your blog- such an inspiration. I have never done goldwork and frankly the supplies may not really be in my budget, but it really fascinates me aesthetically. Also in the past few centuries it’s really gained a connotation for ecclesiastical embroidery which is very far outside my interests, and while I’m really bored of the “subversive” strands in embroidery & fiber art I do like to create work that unites my entire aesthetic. I’ve got a vision of a Doctor Who-inspired piece in silk and gold, for example . . . though maybe a simpler sampler-type piece would be a better first start, lol. I’m an experienced needlepointer but have only used goldwork once — to enhance a Katie Molineux Persimmons scroll. After overcoming my initial fear of the unknown and following Amy Bunger’s instruction, I couched on lots of pearl purl with abandon and now have a wonderfully beautiful piece to proudly display in my home. I’d enjoy learning more about this art (possibly from this bonus book? ), especially now that I discovered this blog and am following your work on medallion project. Thank you for sharing your knowledge! I have done a little goldwork but mostly in kits. Now that I am doing my own designing, I would like to incorporate some of the metallics I have around the house into my work. I’m not afraid of goldwork, just wish that the threads were more easily available in my area. I have never tried goldwork yet, but have always wanted to. I have a couple of magazines with articles and techniques. I have some large embroidery books of stitches which tell about it and I’ve tried a bit of the techniques with Kreinik threads or other gold colored threads. A local shop has recently decided to carry goldwork supplies and the threads are beautiful! I’d like to try this style of work as I am a fan of Renaissance style patterns. Sounds like a good book for learning different technics of gold work. I have done some work with gold mainly on items for churches but could use a reference with nnnmore detail on the different threads and stitches to use with them. advanced embroidery. I was sad yesterday when you said you would not continue the beautiful blue and gold project completion in as great detail, because I have been learning so much from your posts! I am a Crazy Quilter, and CQI group on Yahoo have been doing round robins on “fools” gold-using faux gold materials (poor woman’s stitchery!) but authentic stitchery techniques. I am absolutely new to goldwork, but I love using stranded metallic flosses in my cross stitch, so using gold is not new to mee. Wow! The cover of this book is amazing. I’ve been embroidering off and on for 40 years and have recently discovered Stump Work. I appreciate your daily emails and look forward to trying out the techniques to enhance my work. I’ve always liked the look of the gold work – but didn’t realize it had a specific name. I like to use beads and other multi-media items in my project. This would be so cool to try. Thank you for offering up a contest and good luck to all. I’m new to goldwork – saw it demonstrated at the Knitting & Stitching Show in London last fall (was visiting my daughter in the UK) and saw a demonstration and was fascinated by goldwork. I have put together enough material to try a simple project from a book by Shay Pendray – and would love to become experienced enough to try the projects in this book!! Wow what a wonderful review you gave on goldwork embroidery. I haven’t come across this book! I’ve had a couple of fellow stitchers show me the basic how-to’s of gold work. Your tutorials on your daily pages (medallion and others) have also been fabulous for helping me gain confidence in working with metal threads. I don’t have any goldwork books and can’t find any in our library, so the online references have been best. The look of most threads is very appealing to me, but the checkered is amazing! Your directions are pretty clear, but a book with directions that can be looked at again and again would be very helpful. I so new to gold work I am not sure how to answer your questions. For years I have watch (when possible Shay Pendray) do Japanese gold work on television and been fascinated by the delicacy and beauty. Now that I am retired and have the time to concentrate it is the art I wish to pursue.Seeing the photos almost makes me want to cry I feel so unworthy to be part of such beauty. Nice book LOL. I sure it is a lovely book. Yes I would like to have it but would much rather it go so someone who would use it and benefit from it. Gold work look so beyond my capability’s right now. I tried to exsplane that to my sister when she proudly handed me a book on it for Christmas. She made me promise to try it soon. I now am the owner of a mix mess of gold thread from Ebay. I haven’t a clue yet on where to start. Well..first go through and oh-so-gently sort your threads out and get them calmed and contained. Then when you have an idea of what you have on hand, pick something simple and take your time. Mary, thank you for the giveaway! The book looks beautiful. I am new to goldwork. I actually have some silver japanese thread, but have not really figured out what to do with it besides look at it and admire it. Like a magpie, I’m attracted to shiny things! Oh my gosh! I would love to do some goldwork! I have admired it for quite some time, especially some projects in the Inspirations magazines. Just recently (thanks to some comments on your blog) I have started to pick up a couple of books on goldwork. Yes, I’ll confess I’m a little intimidated. gulp. First to search out the gold threads. Then how to use them and how much do you stretch? I understand they are pretty expensive so you don’t want to make mistakes and waste them. But they are so PRETTY! Yes, I think goldwork is in my future! And mostly thanks to you and your blog! I have a great interest in goldwork. I have not done it but I love stumpwork and this goes very well with stumpwork. The piece you have been working on has greatly inspired me to try this. I love all things that sparkle. Well, I just left a comment yesterday! Hahaha! NEVER have done that before here. I am so enjoying your daily emails AND I not only would love to own this book but am just learning all this “stuff” to add to my artwork. I am just beginning my first piece and trying to learn stumpwork and new stitches to cover it. I am fascinated by the goldwork as well and plan to incorporate it once I have an idea of what I’m doing! I have so many ideas running around in my head and I am SO excited! I had never planned to do goldwork as it looked daunting and I did not have any of the stuff necessary for it. Then one small workshop followed with another and a few trips to India increased my stash and now I have landed up doing a 30in.x 24in. goldwork piece, that my sewing friends love, and I plan to do several more as I have the biggest stash and actually love it. Go figure! I have never ever done it, but oh, I want to. It’s gorgeous! I have done some goldwork, but from the cover it has some ideas I’d like to explore. Perhaps this would be an interesting start. I have never tried goldwork and YES! I am intimidated 🙂 It just seems like it would be harder than most techniques. However, I am ALWAYS willing to learn something new. I love to collect embroidery books. It is relaxing to browse and see all the beautiful work. Goldwork is totally new to me but I am intrigued by all the beautiful effects. What worries me about trying goldwork is the thought that the thread might be difficult to use and then, of course, anything with “gold” in the name might be expensive if I were to do some reverse stitching! I have one goldwork project that is not finished yet from an EGA course. I would love to have this book as a reference. I have worked with pearl purl before as well. I really like your book reviews as well as the detailed instructions and especially the photos – of various new stitches. I am a member of the Cataraqui Guild of Needle Arts and on the program committee. I haven’t done goldwork but next season our group will be doing a workshop as well as a study group on goldwork. This book would be a great asset to our library as a resource when we are working through our exercises. I have never tried goldwork but you have intrigued me to try it. I have two projects I need to finish for upcoming birthdays so after that I shall give it a try. All the examples you have shown are beautiful. I have been trying to work up my nerve to try goldwork. Have been following the posts on the medallion project and actually bought some thread. Thought I might just try couching it first. I’ve done just a bit of goldwork (a bee all in gold and some gold embellishment on surface embroideries) and find it challenging – that is intimidating. One needs to be so exact in placing the gold ‘threads’. I like the challenge of working essentially in monotone and choosing the gold thread that will give the right tone and texture and contrast. I’d love to do more, especially since I received a stash of gold (and silver) threads from a woman who cannot stitch anymore. Hi haven’t done any goldwork as such. i have learnt a few basic stitches in aari work and done some small projects. i am not familiar with what is shown on Mary’s Page. since those materials are not available in my place.Goodluck to the one who wins the Book. You should be able to obtain goldwork materials on-line, or at least I hope you can! This would be a fantastic book to receive. In fact, I just signed up for a goldwork type of RR on one of the major CQ lists and, as a second step to learning more about the techniques ordered this book from the library. I have to say that my first step was reading through all of your archived postings last night. Your site is fantastic! Incredibly instructional, as well as beautifully illustrated. Thanks for this opportunity. I have rediscovered embroidery after a many year hiatus. I love surface embroidery! Goldwork looks so beautiful. I never saw it before discovering this website. I would love to try it, but wouldn’t know where to begin. Thank you for this wonderful website where a returning embroiderer can learn so many new things. I even bound my first embroidery hoop! Omg gold work. Since I am still fairly new to embroidery this is something I have not yet had the courage to attempt and in fact have no idea how to start. But I have been following your church medallion project closely and am just enthralled by the use of gold work. I really hope to win this book as I would love to give gold work a try and a step by step approach with some “coaching” will be just the thing! Thanks for hosting the giveaway and thank you to your quilting friend for bring so sweet and donating it!! Most of my knowledge about goldwork has come from the web so it would be nice to have a book on the subject! As for projects. I did a English style casket, or chest if you prefer, that depicted nursery rhymes from my childhood. There was a bit of goldwork on that but mostly it was a stumpwork piece in wool on linen. My second project was a large stationary box with a Dutch style flower arrangement on the top and English flower “pips” in panels on the sides. On this I used lots of pearl purl on the flowers and check for some of the flower centers. As you can see much of my goldwork has been very basic. What I would REALLY like to learn is how to combing many types of wires, spangles, and passing threads to give dimension to a motif. One of the reasons I find goldwork so fascinating is the texture it adds to a piece of work – so different from the texture that you can obtain with stitches in thread. Hi Mary– I have made a special folder for your e-mails as I don’t have time every day to read them as carefully as I would like. I have done lots of embroidery but never any goldwork> I would love to learn how. I am a crazypatch quilter and it would be awesome on some of my pieces. Thanks for considering me for the copy. I have done some embroidery over the past 30 years but I am by no means an expert. However I do love a challenge and I am always trying new things and crafts. I am able to do all sorts of needle work. After looking at the information provided I think I really love this book. I love how elegant the piece on the cover looks. I can see my self trying this type of embroidery and hope I am able to do so in the near future whether I win the book or not. Thank you for giving me an opportunity to win such a nice book. What a beautiful book! Thank you for this opportunity. I have never tried goldwork as of yet, but after seeing the projects on your site and from other places, I’m very intrigued by it’s beauty, sparkle, glimmer, and intricacy. I’m a little afraid of maybe ruining the goldwork thread, as I learn, but it looks too beautiful not to try! I have primarily worked in cross stitch (for about 29 years or so); but also, specialty stitches, hardanger and some Brazilian embroidery too. What do you like best about goldwork? I love the variety of textures that are emphasized by the shine of the materials. The amount of contrast possible while staying in the same colour palette is thrilling. What attracts you to it? I like the formal designs that goldwork is most often used for. If so, what is it based on? The materials are comparatively expensive and not readily available. I fear that my learning curve would be frustrating and wasteful. Do you have any favorite goldwork technique, or favorite goldwork thread? (or anything along those lines). I really like the chipping you’ve been doing on the goldwork dots. But I’m very partial to smooth outlines as well. I am not entering the contest as I just bought this book via amazon. How ironic right? I just want to say that this book and the book Goldwork by Hazel Everett gave me the instruction and actual confidence to try goldwork. My first and last embroidery lesson was when I was four years old, since then it has been all self teaching and now this wonderful website! I look forward to seeing who wins the book and to discussing both traditional goldwork and metal work with colored bullions, which unfortunately are almost impossible to get. Does anybody else have a source other than Heritage Trading on ebay? PS – I recently ordered from Hedgehog Handworks and while I didn’t click from here to there I did send them an email to let them know it was your site that led me to them. I’m American but live in England. The best source for goldwork supplies that I’ve found is a husband and wife business in Gloucester. Unfortunately, they don’t have a website. If that doesn’t put you off, let me know and I am willing to scan and email you their price list. They are very good about sending samples of product at a very small cost and have the largest selection at the best prices that I’ve found either at shows or online. I have never done goldwork and I think it’s beautiful. I would love to get into it but the materials cost scares me! I especially love the clean lines and bright colors of things like those Persian tiles or your medallion project; I would love to do something like that. In one of your past blogs you wrote about Erica Wilson. I watched her videos on youtube as you recommended. After watching the one on goldwork, I decided that I want to try it. Country Bumpkins has a small goldwork project kit that I am itching to get my hands on. I would love to own this book if it would help me to do goldwork. Hi Mary, I have recently started to stitch with gold threads. I just completed Trisha’s online glove class. I was very intimidated by gold work in the past and while I don’t feel entirely comfortable with it all yet; I love it and can’t wait to do more. I sometimes feel that the gold threads are very “heavy, have you ever felt this? Thanks,Mary. I own this book already so please do not put me in the drawing. It is a wonderful book for those of is who are “newbies” to goldwork. I found your website via another embroiderer’s website/blog. It is very fascinating and wonderful for me since I am exploring and learning about Opus Anglicanum. Gold work has always been a challenge for me – chosing the thread, how to stitch it down and how many library books I can borrow for x-amount of days before they look at me funny! I will say I will never have the patience for Or Nue. It is too beautiful but it looks so very hard. Right now I am working on an Opus Anglicanum purse with pictures from the English Book of Hours. Th subject is the cat archers attacking the rat knights. I love whimsey! I have wanted to try Goldwork since seeing your work on the Medallion. You have a knack for breaking things down so that each step is doable. Thank-you so much for starting me on another embroidery technique – I love buying new types of thread – it just makes me smile. Goldwork is thrilling to me. I haven’t done much of it because of the expense, but I have done a bit of couching and have been working on a stash of the different types of threads over the past few years. If I have a fear of it, it would be of the expense and how I could very easily get myself into trouble at Hedgehog’s. I want to learn all of it. I love the richness and glow of it. I love how it immediately makes the piece come alive. I love the history of it, too. It is an adventure to me to experiment with it. I actually own a set of koma and some goldwork tools. It was Ruth Chamberlin’s Beginner’s Guide to Goldwork book that gave me a love of embroidery and where I first learned goldwork techniques. There was one passage in that book that talked about the care of how she placed each and every stitch so it was perfect that really got me. My interest in goldwork started with you, Mary. I have learned so much from you that I feel embarrased sometimes to call my skills my own. Thank you for all you do! I’ve never done goldwork, but I’ve been interested in taking it up, for a while; probably for ordination gifts! That’s so kind of you! 😀 I’ve dabbled a bit in goldwork, I did a one day course last year and I made something about a month ago with goldwork, cotton and wool. In fact, I just got a bunch of threads to do another goldwork piece! It’s really a very enjoyable technique, I think what I like best about it is that there are so many different threads and so many ways of using one thread. It’s fun to think of how you’re going to use them and experiment! I have never done goldwork. But last October I had the privlige to see some amazing pieces up close. I took a class through the Royal School of Needlework in San Francisco on silk shading. While there the instructors shared some goldwork that their students had compleated during the intensive. The pieces were beautiful! I am looking forward to giving goldwork a try. I am an embroiderer of many years, but I have never tried goldwork. Frankly, embroidery is a challenge for me, because I am one of the very rare women who is color blind, and having someone else pick my floss is difficult since my daughter went to college. Goldwork = no color! Okay, wow, I’m really amazed that people would do that. I’m not naive, but try to win a book to re-sell it?!? Come on. I don’t even enter when I feel like it’s not really my thing, just so it can go to someone that does really like it. But I’m all for beautiful things that sparkle and I read in your review that there are a 100 pages devoted to projects and that sounds terrific! I really enjoy your website. it makes me try new (to me)stitches and techniques. Goldwork really intrigues me, I want to learn more about it. the book would be great; I’ll keep an eye out for it. Perhaps you could recommend kits for goldwork and other 3-D techniques. I’d like to try but am hesitant to invest in supplies/kits only to find them short supplied or poor quality. That is so generous of you. I took a Goldwork class last summer, so in that sense I am a newbie to Goldwork. I love the textures that can be achieved in Goldwork but I use awl and always wonder if I have ended the work correctly so that my work does not unravel. I tried my first goldwork piece before taking the class on my own with reference books and did not end my final stitch correctly. I had some 2 inches of work unravel immediately. I have overcome this fear after learning and correcting my technique to an extent. I love working with purl thread though the quality of the purl thread available in India is very different from those available in the rest of the world. I have done some gold work but would like to learn more. The beauty of gold can not be duplicated anywhere or with any other thread. I am always looking to try new kinds of embroidery. I haven’t actually done any Goldwork yet but I think it is beautiful and would love the chance to learn it. A very dear friend of the family taught me to embroider when I was a little girl and I have just started getting back into it. As you know, I’m a lover of the history of embroidery and textiles. But I was just considering some goldwork kits to get started-inspired by the gold work you’ve done on the Medallion project! I’m now collecting books and learning all I can-how I would love to spend time at the RA, but can’t leave my family! So having the information in my own personal library would be an added treat. Having not yet dabbled in the art, and wanting to, this book would give me a great start. And I have to say, I love it when books are shared from one library to another. I used to do wedding and party planning…this gives me an idea for my books! Yes I have tried and will continue to try to work with gold. I was entranced by the look and at Joanne Fabric, figured I’d start with something small and bought the little squiggled up chips of gold. (whatever they’re called). Then I was really in a quandary as to how to use them to their best advantage. Some of your videos did help and motivated me to forge onward with Kreinik Metallics. Oh Jeez ! What a disaster! The only thing I could do was double, triple the thread then just couch it. It looked awful ! (No point in threading them into a needle. The thread kept breaking and just “whisping off into the air”. So, discouraged, I set aside, (again!) the pastoral that I have been working on since Mrs. Moses held classes on the ark! I do want to work the gold into my sunrise but I’m such a klutz. I truly hope that the book will have lots of idiot’s delight pictures and diagrams for me, like you do with the “needle IN at this point and OUT at that point”. At least you give me hope and courage to make strides, albeit small ones. Thanks….had to get that off my chest! I have tried some goldwork in the past (many moons ago) and was very intimidated by it. Reading your blog has given me new courage to try it again. I have some threads in safe keeping, so will be pulling them out and trying again. What attracts me is the many varieties of goldwork threads, and the sheens they produce. This book would be an incentive to try again with the techniques to do it right. It would be a perfect learning tool. Thank you Mary for making books like this available. I so enjoy your daily blog! I have not done any goldwork although I like the look; I haven’t really come up with anything I’d use it on. But, this give-away made me think about it a little and I think embellishing an evening bag would be a good project. I have a lovely burgandy satin and velvet bag that would do admirably. I’m presently working on a tiger set in grass for my niece; I have been using Trish Burr’s books to aid me and find them very helpful. So this book would be very useful in the evening bag project. I love gold work (and silver) but it can be challenging with hand sewing, machine sewing, and even when used in bobbin lace or lace knitting. I find thread qualities vary, so I try to choose carefully. This appears to be a great book, and I LOVE the meticulous details, which I consider a priority. I have done needlework for many decades, but haven’t done gold or silver work for awhile, unfortunately. I have not done gold work, but it does fascinate me. I have followed with great interest your medallion project. I love the rich look of gold combined with deep colors. Winning this book just might push me into the world of gold! Well, I have never done any goldwork. I have no idea where I would begin. It seems to be completely impossible – that I might be able to do that. What needle? What backing? What fabric? WAIT! Machine, you say – well now maybe I could…. I haven’t done any goldwork yet, but I did snag a Tanja Berlin goldwork kit off ebay for cheap. I really want to start it… but I’m terrified of messing it up! Especially since all I’ve done is crewel type embroidery so far. And it’s the “Harebell” kit, so there’s the added colored couching/shading to do. I guess I just don’t have enough confidence in myself yet to start it. But it does look beautiful. I think the check purl thread would be my favorite. It’s just so shiny! I always want to try goldwork, because I love those old Chinese emperor gown filled with dragon, cloud, or flower goldwork. I am a newbie to goldwork, first I tried machine gold thread embroidery but little success. I was frustrated with loose threads, so I tried hand embroidery instead. It would be great to learn some more techniques from this book if I won it. Thank you. Mary: I’m new to goldwork. I would love to win this book. I have never attempted goldwork but after seeing the awsome pieces on your site,I gave in to temptation and bought gold threads of every type available in the craft departments here in our town.I have been researching goldwork on line too,….need more sites. I hope when you draw the winning name,Luck will shine on me…..Thank You for the inspiration to expand my needlework skills,Judy. I never did goldwork embroidery. I would like to try it but I am afraid. It seems quite difficult and I don’t know if I have all the knowledge required to practice this kind of work. So a book like this would quite heplful. What a wonderful looking book, Mary. I’ve been following your medallion project and have been fascinated with your use of metalic thread. I’ve wanted to take a class in Gold Work for a long time but haven’t had the opportunity but I do fairly well with “self study” so this would be a valuabe resource. Thanks for sharing it with us! Am currently taking a stumpwork class and loving it. This book looks as though it has lots of potential to expand my horizons. Hi Mary, I do plain old hand embroidery but that’s about to change!!! I have never done goldwork before & would love to try it. I first seen it demonstrated on a tv show with Shay Pendray many years ago. I love the look & have been admiring your Medallion project. I had two things I feared about goldwork. First, where to get the thread but thanks to your links I think I can find it and what to look for in the gold threads. The other “fear” or question I have is, does it tarnish or dull? I think Shay wore white gloves while using it. I also want to say I am thrilled at the daily e-mails I receive from you. I am so glad I found your site and amazed at stitches I never heard of or seen in any of my embroidery books! I tried the Turkish rug stitch the other day & I’m excited to use it for a little kitty’s fur but it will be awhile because I will do it last. I’m afraid I might crush it while working on other areas. Thank you again for sharing your talent & knowledge. Do you have any favorite goldwork technique, or favorite goldwork thread? (or anything along those lines). I am not new to Goldwork and have over the years done several pieces. What I like about goldwork is the way it looks when completed. It has a rich and luxurious look about it. I have taken courses with Tanya Berlin and do not fear working with it. I love to see how it comes together. One of my favorite pieces is Golden Lotus by Alison Cole. I consider myself new to goldwork, and I am anxious to learn. I have admired pieces done for liturgial purposes and I did attempt to mend one piece for use, but I had no knowledge or reference works at all to guide me. In fact, it was researching goldwork online that brought me to this website in the first place. What I like best, and what attracts me is the elegance. Since I haven’t actually started doing it yet (I am still ‘getting myself together’ in order to start a project) I don’t have any favorite goldwork technique, though I love the samples using the purl that I have seen. No, I do not have any fear of goldwork, or of any needlework – only a great desire to learn all I can. I haven’t tried Goldwork as such, but I have used some Gold thread in my Stumpwork. I have admired many pieces of Goldwork on a visit to the UK a while go and have always wanted to try it. This book looks beautiful. I’m a total beginner in goldwork. You got me hooked with your Tudor Rose and now even more with your current project. I have tried a little bit with “fake” gold. I’ve been reluctant to invest a large amount in supplies until I know I can do it. I need to get this book or another like it so I can learn everything I need before I order a bunch of stuff I don’t need. My love of gold work began in 2008 when I took a two week gold work class at the Royal School of Needlework in London. I designed completed a golden butterfly and a heron (in silver threads) and am now working on a correspondence course, Spring Splendor, with Kay Stanis. I love shading silks with the gold threads. Also love to add character to my pieces with other gold threads, inserting them, using Japan threads and cut pieces sewn down, etc. What fun! I have only done one goldwork project and it was a course given by Embroidery Canada, through my chapter The Vancouver Guild of Embroiderers. I found it very interesting and purchased all my goldwork supplies from Tanja Berlin. I really don’t have much experience in this technique and would love to have this book on my shelf. first of all thanks for the Erica Wilson link in youtube. I didn´t know she passed away already. I like her books on embroidery. Goldwork: I don´t know whether you have seen my goldworks. At the moment I am still working on my largest project. I would like to learn new goldwork techniques. I still have not explored goldwork. I would like to put all techniques in one project, so that it would almost look like a sampler. I LOVE the look of goldwork; the closest I have come to actually Doing any was to couch down some Jap gold cording on a glove cuff..before I joined a renaissance-recreation group I didn`t even know it existed–and now I want to learn…looks like a great reference to have! How kind of you to offer us this copy of Mary Brown’s book. I have done very little actual goldwork, but once in a while I use gold threads when I make ecclesiastical stoles or worship paraments. I am hoping to discover some ideas about how to work with metallic/gold threads and not have them break or fray. I know that shorter threads help, but they always seem to fall apart so much easier and are so much more difficult to work with than cottons and wools. Maybe this book will give me the incentive to stitch the Christmas stole and chasuble I have had floating in my head. I have made three sets fo clergy stoles and this will help me add more embroidery to the applique that I already do. I also get asked questions about different types of embroidery when I am teaching at the fabric store, but my expertise is really in counted cross stitch and hand quilting as well as simple needlepoint. This book would help me add some elegance to my current needlework gain some new information to use in my teaching and sharing of needlework as well. If nothing else, it will give me incentive to begin some new Christmas ornaments. Mary this is a fantastic book, I have a copy signed by Tracey Franklin, Mary was one of her students at the Royal School of Needlework. If I was lucky to win this copy it will be a gift to a friend, as I already own one. We are currently in a Goldwork Crazy Quilting Round Robin, and I’ve getting loads of ideas from it. Yes, I am new to goldwork. I have poured over the Hinda Hands Church Embroidery book, her goldwork sampler design, and a few other more recent publications. I’ve been going back through all of the Needle’nThread pattern archives, looking for a nice goldwork pattern to start with. I have actually practiced goldwork a little bit – I have the couching down, and have plunged threads to the back – all following the posts here, and the directions in the A to Z Goldwork Book. Just this week, I received my order of goldwork thread from Hedgehog Handiworks. I’m a little afraid to dive in yet on the goldwork, but I have to get going. My favorite threads are the beautiful Elizabethan twist and the gold faconnee. The Elizabethan Twist is so small and fine – I don’t know how you used that for all of the background on the medallion project, Mary! I’m anxious to try doing chipping for filling, and trying some padding with the goldwork. Hm….maybe the Tudor rose might be a perfect starting piece. I do have Mary Brown’s Goldwork book on my Amazon list. I love the books I have, but there seems to be a few techniques missing. The book would be a wonderful addition to pour over and use for direction. Thanks for offering this! I have known Mary Brown for many years and I know her dedication to the embroidery world and more particularly to goldwork. I have the same passion and all types of embroidery, but goldwork stands out as one of my favourite techniques. I love the finish, its richness in colour and its uniqueness. This book would be an excellent opportunity to explore goldwork even further. Mary, I’m an embroidery enthusiast but haven’t tried goldwork yet, after watching your monogram project with interest, I think I’d like to have a go (always wanted to do something with my father’s initials). I have a great interest in the history of embroidery and have read a lot about ecclesiastical embroidery in library books, that is what attracts me, it would be very special to do something for our Minister, but I’d have to learn first. I fell in love with goldwork thanks to you Mary !! I really enjoyed the little project “tudor style rose”. I will surely try this technique again. I love goldwork embroidery. I happened to see it around sacred relics at churches and over religious vestiments but never dreamed of doing myself something. To start with, I always considered difficult to find those wires and metal stuff, but now that you, Mary, had brought it over, it is time to think about it and I thank you so much, for making it look so easy to work. I am sure that with your help, we will carry on. Project? I would try a religious work, perhaps a “palia” fot Holy Mass and / or an embroidered frame to put around a Holy Land picture of our Lady of Jesrusalem… I am following up your Medallion work and I am astonished! I love the look it brings to embroidery. Like the red flower you did, the accent is beautiful. I have done a couple of pieces which turned out good. I have not tried the larger/heavier thread-a bit afraid of them. I will continue to use gold work in different pieces as I go along. I like to do different things and teach or show them to others to give them new ideas and works of art. The book would be well used. When I saw your offer, my first thought was to try to win the goldwork book. However, it looked quite familiar to me and sure enough, when I checked I already have it. It is a lovely book and one of only two books that I have on goldwork. It’s something that I haven’t done a great deal of, but I love it and hope to do much more. I count myself very lucky as an American living in England to have been able to visit some places where I could see pieces of goldwork including some done by very wellknown needlewomen. I think it’s wonderful that you’re passing on your duplicate copies of needlework books. Maybe you’ll offer another book that I don’t already have, and I’ll have a chance to win that one. Many thanks for your wonderful website. I’ve tried lots of embroidery techniques but so far not goldwork. I’d love this book as a prod to get me started on a new tangent. The goldwork projects on your posts have been very inspiring! I just love the look of goldwork and admire your posts on it. I’ve never worked with real metal threads, admittedly they do intimidate me a bit. But I do have a goldwork kit lying around somewhere here that I never started. One of the reasons is that after opening the kit I found that the instructions lack a lot of important detail. I’d love to win the book for adding the needed instruction and maybe finally finding the courage to start working on that goldwork project. Wouldn’t it be luverly? Gold-work intrigues me – it is so beautiful, but when I have tried it alone and without guidance, I had knots and ‘bunches of grapes’ and a very trying time. I have asked my teacher for advice, only to be told that I am only a novice and couldn’t handle it. Hey! I’m 70 years old – when will I be able to do it? I have only been embroidering for a few years now (work and family commitments) but I have so much to learn still. Gold-work is stunning and I would so much like to master the skills it takes. I have just learned Brazilian and that is gorgeous but I have a hankering to learn this art that has me so mesmerized and the book Goldwork Embroidery would be well used. What a lovely book cover!! Would love to take a peek inside so I will look up your past review to see more. I have not tried goldwork yet but it is on my list of things to learn. You have shown us so many wonderful tips and lessons on goldwork and it is intriguing. I love all kinds of embroidery and I’m always looking for new skills. I think goldwork is very elegant and rich looking – especially when it is done by an expert like you! That is not sucking up…I really mean it!! I am an experienced embroiderer but have only done a little goldwork, mostly due to the fact that I have not found a suitable use for it in my hand embroidered artworks. I now have a cracker idea and am dying to get into using some of the myriad interesting gold work threads. This book would be a real help in getting things right from the outset. Thanks for the opportunity. It’s so much fun just to be in the mix. I am new to gold work and I really love it. I love the effects. I especially like the gold dots on the medallion project! Hi Mary, I have been following your posts about the goldwork and I have just started to learn it. I love all aspects of it and I am so eager to read all the books you recommended….I have just received my supplies from Tanya, Nordic, and I am waiting for Hedgehog……thank you all the information. This book would be so helpful for and what a beautiful giveaway. Please enter me in the giveaway, and thank you for all of you valuable lessons!!! I’ve done a bit of goldwork, I have goldwork stash, I love the materials and the look of goldwork. I just need a little time to learn more about it and the inspiration of a good book to tackle what is awaiting my needle. Mary Brown’s book sounds like a good start. I am interested to learn more about goldwork. I have been stitching for 4 years now and have joined an embroiderers’ guild in New Zealand. I have also enjoyed helping to coordinate workshops that cover all types of embroidery. Currently we are learning to use stumpwork with goldwork embellishment. I am still rather confused with the types of gold threads. I am also attending our national conference (being held in earthquake damaged Christchurch) and have booked on a goldwork class covering a 6 sided evening bag using goldwork techniques. Can’t wait to learn more. I love it all. I am currently embroidering a wedding waistcoat for my son and would love to include some goldwork bling! I’ve never done goldwork before, and I’d certainly never try without good instruction. Reading your posts about it has taken the edge off of my “that looks too hard” fears, but I am still a bit intimidated. I suspect that a good book would really give me the gold bug! Hello! Thank you so much for doing this! Very generous. 🙂 I’ve never done goldwork, but absolutely love medieval embroidery, especially the very rare stuff done in gold thread. I’ve done a few small pieces that are attempts at replicas but I’ve been to afraid to try anything with gold, not only is it expensive, I’m afraid it’ll show every little error! A book like this would give me the guidance to proceed confidently and hopefully, correctly! Goldwork done well is breathtaking. Maybe someday, I’ll get there. Thanks again! I am fairly new to goldwork. I am working on an altar frontal for the altar of repose for our church. So far, I have tried some couching with gold cording and some chip work in the center of the piece.I love the gorgeous glittery effect it has on the piece. Goldwork is a little intimidating to me because of the cost of the thread. Thank you for the chance to win and beef up our church needle group’s library. There’s a goldwork class by Tanja Berlin and thread painting classes by Tanja and Trish Burr at the upcoming Beating Around the Bush Needlework Convention in Adelaide. For months now, I’ve thought about it, and studied the beautiful project work. As incredible as it would be to meet these talented Master embroidery artists and to join likeminded others at what I’m sure must be a magical event, the overall expense of the trip is too much right now. So I’m teaching myself. That’s how I discovered you! What a site. You are the one stop top-end shop in embroidery techniques and ideas not only of gold work and thread painting but also for any project. I absolutely love your work, and your generosity in sharing … what can I say … beyond words, I’m just blown away. A copy of Mary Brown’s Book from you would be pretty special! I have never done goldwork, but I want to learn. I have been collecting supplies and books. I love the look of the gold. It looks so rich in color. Goldwork – what is not to love about shiny glittering embroidery? I have yet to venture into the world of goldwork, but it is something that I really want to try. Last year I did a course in stumpwork and the tutor is very well known for her goldwork, which is what peaked my interest. I still haven’t tried it, but I look forward to doing so. I think goldwork can look very classy and I particularly like a project that is not strictly goldwork, but incorporates the techniques to give finishing touches or highlights. I also like the fact that goldwork has so many applications. I am a complete gold work newbie, but I keep getting drawn toward the offerings at ANG. To date, I haven’t taken any, but I’m sure the goldwork bug is right around the corner. I especially like the shapes and textures. What scares me the most is being able to find the supplies and then keeping my three cats from finding the supplies. I have only used some gold threads in small quantities in projects but have always wanted to learn using it in more detailed projects. I would love this book if it has beginner step and projects. I have done a tiny bit of goldwork in the past (under the tutelage of Michelle Roberts) but hope to be able to learn more about it in the future. It is a fascinating needlework technique, especially when one thinks about the historical aspects of the craft! I love all the different real metal threads and how just a small amount of them added to a project can make such a difference. I’m also enjoying watching how you’re using metal in the medallion project. Thanks for offering the chance to win this excellent goldwork resource! Your site and your work amaze me anew every time you post. You have re-vitalized my love of the art form and I’m quilting less and embroidering more! I’d love the goldwork book! Hi Mary, I have taken an introductory course in Goldwork that was offered through my Guild, The Canadian Embroiderer’s Guild, London (in Ontario, Canada). Since that time I have collected a stash of different weights of gold (and silver) braid, gold coated fine leather, etc. I would like to get some inspiration for a new project and this book looks like one that might inspire me to use up some of that stash. I think goldwork is one of the few embroidery techniques I haven’t tried. I admire the work that you show us, though, but just haven’t ever had a good reason to try it. The closest thing is stitching Christmas ornaments with gold Krenik thread, using Blackwork patterns to fill in things like gift boxes and bows, trees, and wreaths. I would like to learn how to do it and use it for more Christmas ideas, and also to make beetles! I know that sounds weird, but I just recently found out my sister likes colorful beetles and I am envisioning them in goldwork with greens and blues in the wings. Thanks for the opportunity to win a book and for the inspiration to try a new technique! I’ve done just a little bit of goldwork. I took a class at the RSN last year, and boy, was that totally awesome! (sorry for sounding like a teenager) I am currently working on the Persian Peony Tile which is almost finished. When that is done I will finish the Golden Pomegranate and then design some pieces to accompany the RSN project, Silver Swirls, which is on my blog. (I took advantage of Hedgehog Handworks February sale) Let’s see, then I want to do some Egyptian goddesses as they are so lovely! I love goldwork because I, like all humans, instinctively love gold, but also because I want to make something lovely. I like to see the gold balanced with the silk threads to make a pleasing proportion, but then I really don’t know what the proportion is, just that I’ll like it when I see it. The only fear I have is stretching pearl purl too far and rendering it unusable. My favorite technique is stretching pearl purl and winding silk around it. I cannot get over how lovely that is. OK, so I think I’m one of the few who answered all of your questions, and I hope you’ll be very strict about it in when you pick a winner. But I will understand if you don’t. Oh, and I like to see lots of dots, but you don’t have to write about them. I just want to see them progressing. Thanks for sharing so much information. Your instruction is greately appreciated! I had never done any goldwork until now as I am doing a course from Tric1a Nguyen sn Elizabethan goldwork stitches. I just cannot believe what they have done to the sampler. They just glow! This has made me think that I could tackle something in the modern vein. it looks as if Mary Brown’s book would be ideal. I WANT this book…*sigh* THANK YOU! for making it a possibility (however remote LOL I never win anything). I have been interested in goldwork for several years and have even bought 2 kits but just haven’t had the nerve to try. I have heard it is tricky. I was thinking maybe the book would help. I am constantly inspired by your gorgeous goldwork. Your site has reignited my love affair with embroidery. I have always wanted to know how to work with metals, and this would be a perfect help. I did a short goldwork course based around a Jacobean design and loved it . I still have my cloth to ‘finish some day’ ! The only problem I feel is the expense of the goldwork threads – you can’t substitute in this work as quality shows. but also have to watch the price. Do you have any favorite goldwork technique, or favorite goldwork thread? I love the work you are doing on the medallion – the outlining in various threads for your circles – I would love to work with gold threads in my embroidery word projects. The first day class I did at the RSN was a two day goldwork course, but I have never had the opportunity/ guts to do a piece on my own.. I’m studying for a certificate in embroidery at the moment and am leaving gold work till the end..
I’m relatively new to goldwork, though I’ve done some tiny Or Nue pieces..not sure if that’s the right spelling. I really think it looks majestic. I just made my first attempt at goldwork in my embroidery class– and wow, how difficult it was, to maneuver the threads! And while I find it elegant & beautiful, I’m not sure how to incorporate it into my own work. I’d love to learn more about goldwork and the different ways in which it can be applied. Thanks for the opportunity of owning the wonderful goldwork book if its anything like the A to Z of goldwork than its worth winning. I’m fairly new to goldwork and what I like best about goldwork is the different kinds of gold ranging from smooth gold to the lovely chip gold which gives a lovely sparkle to any embroidery design. I love the different techniques of smooth passing gold from using it like chip work to bending it into different shapes and designs but my favourite is pearl purl stretched and intertwined with thread I really like the effect it gives, I do like the effect of check thread but its difficult to plunge without losing some gold on top. I love the combination of thread and gold especially silk thread and gold which gives a lovely shiny effect. My fear is removing gold especially near stitching and spoiling the work that you have so carefully created. I had to do this recently and my heart was in my mouth just in case I spoiled the goldwork next to it. I am intrigued by the techniques employed in the work. But I do need more practice. I also like what I can pull from it to enhance my needlepoint. What a wonderful gesture! I just found your website. It is WONDERFUL! I am new to goldwork. I’ve embroidered for as long as I can remember, but never done gold work. I’m fascinated with it. I’m looking forward to learning more about it and trying it. Thanks so much for the opportunity to win the book! I love goldwork especially with silk embroidery. I bought a few books first but found them difficult, so I enrolled on a 5-day course in goldwork at the Royal School of Needlework and learnt a lot. I am now able to understand the books. I love chipping. The kit we worked on is now hanging on the wall. Just goldwork, but I intend mixing silk and gold next time. First of all, I love your site and really admire your work. It’s wonderful. Regarding the gold-work: I only used metallic threads on tablet-weaving and I haven’t try them on embroideries. But I love to reproduce medieval textiles crafts so, doing an embroidery with gold work is on my list of things to learn and to try. This book would be great to learn more about this art. Goldwork! I almost disliked it very much (‘almost hated’ is too strong but you get the idea!). I don’t know, I just wasn’t a goldish person I suppose. Or maybe I just THOUGHT I wasn’t. And, like they say, “The rest is …” Oh, and I’ve had a nice little chat with Mary Brown at an embroidery exhibition in Sydney. She was sitting at a little table in the foyer cutting out fabrics for children’s workshops while also filling the role of ‘Information’. It was in my earlier days of embroidery and, would you believe, I was surprised later when realising what role she filled in The Guild and The Embroidery World, that she was there like an ‘ordinary’ person, doing a ‘mundane’ task of cutting out the same shape after shape for a children’s class!!!! Mate, have I learned to appreciate…well, Appreciate with a capital ‘A’ since then. Okay, Mary (the Mary’s have it!) after all this soul searching (yes, my face is red) just put me in the draw eh. Thanks for the opportunity, Cheers, Kath. Mary I have been away from gold work for a long time now but when you mentioned Erica Wilson I can remember my Mother buying me her first book many years ago. I have to say she did at the time give me a boost in confidence to try any and everything. Alas over the years embroidery gave way to many other things. So your suggestion to see snippetts of her show again stirred the desire to give gold work another go. I have to say tho I would like to get away from the too formal designs even tho I do love them as I do like order, but this day and age I feel one should be a able to do a few design and enjoy it just as much. Finally now I have dragged all the gold work materials out of the cupboard( I didn’t realise I had so much) I better start looking at a few more modern gold work books and the web to see just what I am missing out on. I have a few yards of metal coronation cord and I would like to try that out. Watching your medallion come to life givesme a real lift just like the does in an embroidery piece. I’ve been wanting to try goldwork ever since I saw a piece of Or Nue in the Cloisters Museum last year. It’s so precise and fine and detailed. It appeals to my accountant brain :). I’m not new to goldwork, having done a class with Alison Cole and another with Avril Ambrose de Haviland but I’m still relatively inexperienced. I like the different textural effects you can get using a variety of gold threads and techniques. My main fears are over-stretching purls, splitting the finer threads and not keeping my couched threads in smooth lines. I love the effect you get by filling small areas using chipping. I would love this goldwork book as I have several projects that I hope to include some gold work but am not very confident about exactly which one to use. It would also improve my skills at handling gold threads. Thank you again for making another generous offer to your embroidery followers. I have done goldwork before, and have taken a couple of classes. I do more needlepainting but would love to incorporate goldwork into it. I am very new to working with any type of gold. My first and only experience was in a class I took with Tanja Berlin and the Blackwork Lovebirds through Shining Needle Society. I had to redo my gold bullion and probably should redo it, but there is a limit before you wreck the work as we all know. I would love to win this book. Rather like making bread from scratch, once I learn about the materials and how they are formed and what they can do when mixed with other ingredients, I can succeed. Like what’s the difference between Baking Powder and Soda—what types of gold are there and what are they used for. How does yeast work in the bread? How do you get the gold thread to lay best on the fabric or get it to play well with other threads? Thank you, Mary, for sharing your abundance! I’m really new to goldwork. The only “gold” I’ve worked with is the DMC thread, which I’m not sure is real gold. I’m looking into starting it though. I’m making altar clothes for my boyfriends statue of Horus, and my suggestion of white work with a few gold buttons doesn’t have enough sparkle and shine, LOL. But if I do get it, I can expand my skills, so I can possibly get more comissions. I’m also hoping that if I learn gold work I can apply it to silver, since a lot of Pagans have a thing for silver. Actually, I’ve never done goldwork yet. I’m still trying to assemble supplies and such. And the courage to plunge in. I did get a few small gold (gold-tone?) bits at a local EGA show where members were also selling books, threads, and other supplies from their stashes. I do love the results though, no matter what the metal used. I haven’t tried goldwork yet, mostly because I still feel like a beginner (study takes up most of my time) and it seems like quite an expensive learning curve. But I love love looking at it! Thank you for your website, it’s keeping me inspired and motivated! I’m new to goldwork, but have been doing embroidery or other needlework of some kind since I was a teenager. I’ve gone through cycles of crochet and quilting, but I’ve set a goal now in my retirement and slowing down days of making something beautiful for my granddaughters and now 2 tiny great-granddaughters. There’s nothing that I can think of that is more rewarding to me today than to look at “spring” coming on outside, a renewal, if you will, and making a beautiful keepsake for my girls from their Granny. Hi Mary, Thank you for offering the Goldwork Designs and Projects. I am new to crewel embroidery and would to expand my knowledge and work with Gold. The only thing I have done is use the gold metallic in embroidery. I have MS and spend alot of time inside. My needlework is very important to me. I can not sit in front of the TV without doing something with my hands. Gold work is so beautiful and interesting that it makes me want to do it. I have been following your project with the blue and gold and it is wonderful. Thank you for letting me join in with your project. I would really appreciate being considered for the Gold book. The project on the front cover is beautiful. I am new to goldwork. I’ve gotten as far as purchasing instruction books and magazines with instructions but have not bought any of the precious metal threads. The anticipation of the beautiful glint coming from the work is what attracts me to goldwork. My biggest fear is that the metal will tarnish, that I will create big holes in the project when I pull the thread to the back, that the metal will cut the couching thread and that the whole thing will be a waste of such beautiful thread. I find that I am more comfortable with starting something new when I have read instructional material multiple times until it sinks in. Morning Mary, Yes I would like to win the book. I am fairly new to goldwork and my library has very little in the way of goldwork in it. I am embarking on the RSN Certificate Course and as goldwork is not my first choice, it is part of the program, so I will need to learn more about it. I have done a tiny bit of goldwork. My favorite application is when it is mixed with silk shading. I love the bit of sparkle it adds to the silk shading. Thanks again for your generosity in offering this giveaway. Mary, I have resisted goldwork for years saying I didn’t want to have to be adding a slew of new tools and materials to my already bulging stash. In truth, it was really because it terrifies me. But then along comes you with your ecliastical goldwork project and then, the final temptation, the “Strands of gold, shades of blue” project in the last Inspirations magazine. I sent away for the kit. This is my project for the summer. I am still terrified but I am determined to try goldwork at least this one time. I will need all the help I can get and this book could be part of that help. I have done very little with goldwork, mainly a few Christmas ornaments with Japan Gold and Crescent stitches that turned out very nice. Have a couple of books about goldwork in my library but haven’t found any projects in them to entice me. The cover of this book you offer could be the one. Thank you so much for this chance to win a lovely book. I’m fairly new to your site, newsletter, and surface embroidery. Margaret Cobleigh and I are in a stitching group and she’s a constant inspiration. Your medallion has inspired me to learn goldwork. It;s so amazingly beautiful and the techniques are fascinating, so I’m very interested in the chance to acquire this book. I am a complete beginner to Goldwork and have yet to take the plunge but have been saving threads, gold leather pieces etc.until I have a big enough stash to do so. I have treated myself to Hazel Everetts goldwork book but would love to get another book to compare patterns, styles etc. I’m a real beginner to goldwork. I’d bought a kit from Joggles a couple of years ago, but the instructions were quite scant. I also purchased every type of thread they had at the time, and everything is still sitting in a bag, in the dark since I’m not sure what to do. I did complete the padding required – that’s a start. Looking at Amazon’s pics from this book, I really love the look of the Vine of Flowers as well as the Basket of Flowers. I have never tried goldwork, but one day I’ll do it. I already have few good books about goldwork, but I like to have a lot of information then I am preparing to start something new, especially in embroidery. Goldwork Embroidery looks like a great read, and it should give me some examples to try. I have a few kits containing gold work, mostly Brazillian embroidery, that I am afraid to try, because I don’t understand the directions clearly. Sorry about the duplicate entry. I stopped to look back and see if the title was Goldwork or Goldenwork, And I couldn’t get back to my original email. Seeing Goldwork is like eating candy. A sweet thing. I do not do goldwork but perhaps someday I will. Not enough confidence yet. Working on regular embroidery at this time as my skills improve. Love what you are doing, it is beautiful +. I love gold work and would love an excuse to do a course on it, because gold work is stunning, but it looks very difficult to do. Why? Because it looks like your stitches need to be extremely precise to lay the gold threads so close together and so that they sit so nicely. Also, the ‘threads’, from what I can tell in the pictures, look very different to ‘normal’ threads like stranded silk or cloche, especially the curly looking ones. So would I like to win the gold work book to prove myself wrong, – you bet. Thanks for such an interesting and informative website, Mary. I am fairly new to goldwork, but want to do it more. I sew and restore priestly vestments, and learning goldwork is almost essential. Not to mention it’s superior beauty for the greater honor and glory of God. I also help others through you, in learning this almost lost art. Your articles, help, and resources are truly a Godsend! Just a thought for all of you who keep saying you do not have the confidence yet: Everyone of us began somewhere and had a first project. Mine hangs in my bathroom even though it is almost 40 years old now. We will never feel confident to do anything until we actually do it. Yes goldwork is a little pricey, but if you look at any of our work from where we began to where we are today, it only gets better with practice. So put on your NIKE’s: JUST DO IT! and then share with all of us so we can clap and cheer in our virtual space. We aren’t policing your work, but rejoicing that you have made the attempt when we may not have gotten there yet. Happy Stitching Everyone! I have done a tiny bit of goldwork but have used the inexpensive over-the-counter DMC threads. The experience was challenging because there are tips and tricks for using these types of threads that are different than for regular cotton threads and I don’t know them. I want to know them. After I master the cheap ones, I will be able to justify purchasing some more expensive goldwork materials and this book would be a valuable guide as I don’t own any books specifically just for goldwork. Thanks! I am new to embroidery but am interested in learning more about gold work. I love ecclesiastical embroidery and would like to learn more about the techniques that are used when embroidering with gold. A book on gold work! Who wouldn’t want that, used or not. I am new to gold work. I do not take classes as I enjoy books and learning so there is nothing more fun for me than to learn a new method by reading a book. That’s what I will do should I win. And as an aside, sell a book? Ha! Never! Hi – I’ve been exploring the world of the needle arts for the past five years, and the quilting led to the embroidery. Goldwork is especially attractive because it appeals to my inner six-year-old girl, who loves gold, glitter and glamour. I’m not going to wear fairy princess clothes, but maybe I’ll embroider something regal. Thanks for your consideration! I’m brand new to goldwork. The main attraction is how pretty and shiny it is. The main fear is that I’ll end up wasting a lot of materials as I blunder through it. I don’t have a particular favourite technique, but I find your Tudor Rose gorgeous! Mary, I have several books on golwork including the A to Z Silk and Goldwork,ut it seems very difficult to do easily. I am confused about all the different goldwork threads. Specifically is there an easy way to just outline what you have stitched in gold. What type of thread would you use there? Is it difficult? Whaat kind of goldwork requires you to cut it and with what on a velvet pad. Sounds like I need some help. Maybe winninng this book would help and if I don’t win could you answer my questions. I am new to gold work, but not new to embroidery. I would like to try my hand and learn this, as gold work has always been appealing. This would be something different than my usual projects which I always feel “safe” stitching. Since I have just started a subscription to Inspiration magazine, I’m seeing more beautiful applications with gold work. Would really enjoy learning with a good book. I love the look of goldwork but have yet to give it a try. At the moment the cost of the supplies holds me back, along with the thoughts of ruining whatever I tackle. I know I just need to bite the bullet and take it on!! Goldwork embroidery is so beautiful and fascinating! Never having done it myself I would love to learn. I love how Goldwork embroidery always finds a way to look majestic, regal,and bold yet graceful. The projects in the book look so fun to learn. Very beautiful. I have only done one piece of goldwork so far but am very keen to explore some more of it as it is definitely something that appeals to me. I love all kinds of embroidery and have done mostly surface embroidery and cross stitch. Projects to explore this year include crewel work and some more gold work. This book would most surely be very helpful in guiding me in the art of goldwork embroidery. Love your webiste. Hi Mary, I haven’t tried goldwork before and i am really nervous about trying it. it looks difficult & complicated, but I am sure it probably is not. I have been chomping at the bit to try my hand at goldwork! I have purchased a good supply of pearl purl, check, smooth and rough bullion, passing and crouching threads. I have been searching for the inspiration to motivate me to commit to a design I can handle. I teach Family and Consumer Sciences at our local high school and I frequently share my projects with my students in the hopes of inspiring them to learn a new skill or technique. I have shown them my collection of beautiful golden threads and they keep asking me what I am going to make with them. I think this lovely book just might contain the idea or inspiration I have been looking for, and allow me to share this beautiful art with another generation of embroiderers. My students and I would all enjoy this book very much. Don’t worry about posting often about your medallion project, I think you are moving very fast for such an intricate project, it just looks so, well I was going to say professional, but then you are a professional of course!! I especially love the gold dots and the background gold work over the satin stitch white parts. Of course I am biased as I love the combination of royal blues and gold, now I’ve just seen your pics of red on the Tudor roses, how exciting must that be now!! I’ve used a few different metallic threads for stitching, and although it is more difficult to stitch compared to plain floss, the effects are terrific and well worth while. I am about to add some blending filament in gold and silver to a picture too…I’ve been a bit nervous to start, but you inspire me! I suppose the “fear” is of the unknown and hoping that I don’t muck up the plain stitching I’ve done already. I know some people say they don’t like Kreinik metallics, but the #4 braid works fine for me. I did buy some Thread Heaven to use if the stitching was hard, but I found I didn’t need it, no tangles, then I read somewhere that if you do part without and part with Thread Heaven that the metallics look different. Anyone tested that?? I did goldwork once for an EGA GCC. I have some threads and am eager to try it again. I would enjoy this book as a resource. I’ve never done any real goldwork style embroidery. I have use the DMC gold metallic together with other threads, but I don’t remember what or where! I’ve never splurged on real gold metallic thread or any of the fancy stuff that you use. I’d be afraid of messing up with something espensive! Maybe looking at the photos in this book will inspire me. Thanks, Mary. Hi Mary, I made a vain attempt at teaching myself “Goldwork”, I tried to follow Tanja Berlin’s design in Inspirations 43, I used all suggested threads and notions as suggested, metal threads by Benton and Johnson, I am sorry Tanja I failed I believe the project was for beginners or maybe not, I wonder if this book would be of further assistance to me as I am still keen to learn. I am very attracted to goldwork, and have been inspired to try it! I having truly enjoyed your email series on this subject and I would love to start a beginner’s project. What a great giveaway for a wonderful stitching resource and I would love a chance to enter! I have done a little gold work over the years. This book looks fabulous and I would use it to help our needle arts guild come up to speed in gold work. Yes, I’m a bit scared of Goldwork. I haven’t attempted it yet because of the financial cost of making a blooper! It is high on my list of to-do’s and I will be learning it in the second year of my course that I am doing with the Embroiderer’d Guild. Can’t wait! I recently took a three day workshop with Tanja Berlin, a graduate of the Royal School of Needlework. She was teaching needle painting. This was a technique that I had wanted to learn for some time. We were all so impressed with her teaching style that the group decided that we would like to invite her back to teach us all how to do Goldwork. I have only attempted Goldwork once when my daughter decided that she wanted me to embroider a gold dragon on the front of her Chinese style graduation dress. It turned out quite nice considering I had never done this before. Some years later I bought a bundle of gold threads of different weights from a needlecraft store that was unfortunately going out of business. I always knew that some day I would learn to do Goldwork. Your lovely book would surely inspire me to use my neglected gold threads. I would love this book because it’s a technique that is new to me. I’ve never done it but would love to learn. I’ll be going to this year’s National EGA Seminar in Santa Fe and the class I selected is goldwork because I’d like to have a hands on class to learn the threads and techniques involved in creating the beautiful goldwork pieces. I have a love of books on embroidery and love to read through them to refresh my memory on stitches or to get my creative juices flowing. This would definitely be read from cover to cover and used in my embroidery. Definitely not resold since I can’t bear to part with any of my books! I have read your progress with the Medallion project with great interest. I have not worked with gold thread in an embroidery project but I am looking forward to the challenge. I am always attracted to “glittery” treasures. I would love to own a book as a reference. I feel that it will be important to see what others have done with gold work before I jump in myself. I stumbled onto your site when I recently started embroidery. The video demonstrations of the stitches are very useful, and your book reviews are very informative (they have helped me decide which books to purchase). I’m getting married and would love to incorporate goldwork on some motifs for my veil&bolero. I know that I might be jumping in the deep end with this, but I’m really keen to try it! This book would really help. Mary, I’m a big fun of your website, your videos have inspired me to start projects that I’ll never thought I’ll finish all by myself. I was also able to make my own embroidery frame which it feels great to stitch in. And because of all your useful information and great pictures my embroidery time is so relaxing and exiting. Thank you so much! Probably too late to win the book, but it looks great. I am new to goldwork, never tried it before but would love to give it a try. I already have some designs in mind I would like to make. Your review was excellent of the Hazel Everett book I am impressed! I love goldwork. I haven’t done a lot, but am trying to learn more. I mainly stitch Brazilian Embroidery, but have a little of every type embroidery in my 76 years. Starting at age 12 I had to learn basics of all sewing, embroidery, crochet and knit. It has held me in good stead and is a wonderful relaxing hobby. I really want to learn more about goldwork and really want this book. Hi, I have just received today Meg Evans Hand-Stitched Boxes which has come from USA. Looking through it I could not believe where it comes from, I used to live about half an hour away from Welwyn, but then I was at work in London, I now live in Lincolnshire which I love. I have always loved designing and making things in machine embroidery and appliqué just from myself and friends. I have joined a local quilting club and have meet a lot of friends and of course learning new techniques. Now just by looking on my iPad I have found you because of trying to find where to buy what is needed for the boxes. I love reading what you have done and are doing, it makes me me fill so excited to find such a lovely site and so much information, thank you. Next Next post: Goldwork & Silk Medallion: On the Edge!